This isn’t easy to absorb, since the Cardinals still have a full week of OTAs and a mandatory minicamp to go (and I still have a vacation to take), but today marks 100 days until the Cards open the regular season in St. Louis. There is much left to do before that day of course. 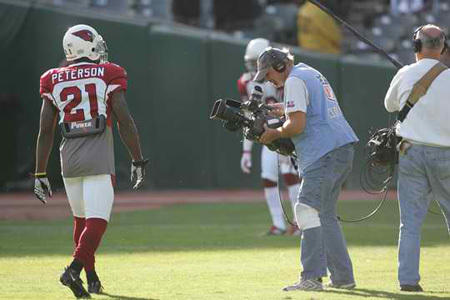 Not only do the Cardinals finish out the offseason work but there is still training camp to go. There’s too much time left to really know how this roster is going to break down, but there will be interesting battles for playing time coming. Has Lorenzo Alexander usurped O’Brien Schofield for good? How will all the inside linebackers fit together once Daryl Washington’s suspension ends (although that’s a story for well beyond the opener)? How will Levi Brown look once he is completely cleared to play? Most importantly: How will the new-look Cardinals perform when the games count for real? In 100 days, we’ll find out. — Many have asked about the Larry Fitzgerald comments regarding the health of Ryan Swope. As I have indicated to some, I frankly hadn’t been looking for Swope one way or the other of late. On-field work resumes next week, and at some point, coach Bruce Arians will be available to talk again. I’d guess it will be addressed then. — An NFL.com story talking about Ken Whisenhunt, now the Chargers offensive coordinator, working with QB Philip Rivers. “It always starts with the quarterback,” Whiz says, and we all know not only is that true, but that Whiz lived with the consequences of it. — Speaking of Whiz and one of his former signal-callers, wondering where Max Hall is these days? Trying to QB in Canada. — The Cardinals signed punter Will Batson Monday. Batson also can kick field goals and kick off, so he’ll fill the role of Ricky Schmitt for this offseason and preseason, I’d think — which means he’s a major long shot. Ultimately, Dave Zastudil (who was very good last year) will be the punter and Jay Feely the kicker. This just gives the Cards an extra helper with a 90-man roster. Batson was with the Titans in preseason last year. — There will be a special edition of the Big Red Rage this Thursday night at 6 p.m. at the regular spot, Majerle’s Sports Grill in Chandler. Exact details are still being firmed up, but it will be live on Arizona Sports 620 and one of the guests will be General Manager Steve Keim. — The 2013 Cardinals Cheerleaders will be announced on the site Friday. We will have a series of videos posted this week (1 p.m. so don’t miss them) detailing the audition process. — I find it interesting that Kevin Kolb signs with the Bills after it could be argued that, had he not gotten hurt against the Bills last season, he might still be a Cardinal. (Then again, following that logic, there might not have been a coaching change at all. But I digress.) He’s got big plans for Buffalo. — It’s like Harvard winning the NCAA tournament. — Presented without comment: Former Cardinals QB Max Hall has signed with the Winnipeg Blue Bombers of the CFL. No one is going to argue that Kevin Kolb has struggled at quarterback. That is clear, especially over the past few games. No will will argue that the Cardinals at three wins after seven games last year, which, while not impressive, is much better than one. That said, it’s probably time to clear up some misconceptions about what the Cards are getting at quarterback now compared to last season. Kolb: 129-for-227, 1706 yards, 8 TD, 8 INT, 56.8 comp pct, 24 sacks, 77.8 passing rating. The Cardinals wanted Brodie Croyle at quarterback because he did come from Todd Haley’s system, and there are similarities with that and what the Cards run. Coach Ken Whisenhunt said the Cards waived-injured Max Hall because it was the only way they could have any chance of bringing Hall back this season. They can injury settle with Hall and then re-sign him down the road. Will it happen/be necessary? Well, if there is an injury, I could see wanting to turn back to Hall. Otherwise, I’m not sure it would happen. As for Croyle, with two games in five days (the Cards play Saturday and again Thursday), they need someone who didn’t come in completely cold. It’s not like they are bringing him in just because of that, Whisenhunt said, but it was a major factor. “We did have good grades on him coming out,” Whiz said. 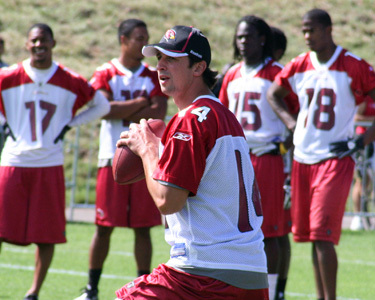 — Whisenhunt said it was “competition” for incumbent punter Ben Graham as to why the Cards signed veteran Dave Zastudil. Punting, Whisenhunt said, was one of many areas that needed to be improved from 2010. In 2009, Graham was fantastic, but the team played to his strengths — the offense gained so many yards they were often near or beyond the 50, able to let Graham pin teams deep. When the offense struggles and Graham is forced to kick deep, he can drive it long, but the hang time allows for bigger returns. — Kolb avoided a high-speed accident Tuesday night — he swerved on his Segway so he didn’t hit a skunk. That would have been a disaster. Whisenhunt said he’s dodged a few skunks in camp himself. — Someone asked Kolb if he would get butterflies before his first home game. He said he gets butterflies before practice. “I take this game serious,” he said, and it was hard not to flash back to the Cardinals quarterback of last season. “I get amped up and ready to go, practice, preseason whatever it is,” Kolb added. — Kolb said he was going to play into the third quarter. Whisenhunt would not commit to that, but did say it was a possibility. Playing into the third would allow Kolb to come out and play after halftime, which is always good for the starter to go through. Kolb joked that that was a big reason to look forward to this game, learning stuff like that. He doesn’t even know where the stadium is yet. — Tight end Stephen Spach (calf) and quarterback John Skelton (ankle) are making “good progress.” What that means practice-wise or game-wise is TBD. The debate over whether Max Hall could make it back to the Cardinals’ roster is over for this year. After suffering a subluxed left shoulder in practice Monday, Hall was waived-injured Wednesday. If Hall clears waivers, he ends up on injured reserve. The Cardinals did end up signing veteran quarterback Brodie Croyle to fill the third quarterback spot, with John Skelton still sidelined with a right ankle sprain. They also signed veteran punter Dave Zastudil to battle Ben Graham. The other move to make roster room was to release undrafted rookie free agent tackle Jake Vermiglio. Zastudil kicked for the Ravens and Browns from 2002-2009, missing all of last season with — coincidentally, given the events with running back Ryan Williams — a torn patella tendon in his plant leg. Zastudil has averaged 42.7 yards a punt in his career. As for Croyle, I wouldn’t expect him to be able to beat out Rich Bartel or Skelton. He’ll be around for the balance of camp. Maybe he can show something in the final two weeks, but it will be difficult. Quarterback John Skelton sprained his ankle in the Green Bay game and missed practice yesterday, while Max Hall had to come out after getting tripped up on a scramble and landing on his left shoulder. Down to two healthy QBs in Kevin Kolb and Rich Bartel, it’s no surprise to see Kent Somers’ Tweet that the Cards will sign former Chiefs QB Brodie Croyle. — UPDATE: Coach Ken Whisenhunt said Hall has a subluxed left shoulder, the same injury — and same shoulder — that sidelined Hall at the end of last season. It’s a type of slight dislocation. The Cards will have to get someone, but they are “exploring options.” Whisenhunt said he couldn’t say if the replacement would be Croyle. The good news is that if the shoulder problem is chronic — and again, it’s the same shoulder as last year — Hall may only need a few days to recover depending on the pain tolerance. Whiz said Hall will be further evaluated to find out his return timetable. Skelton looks like he has a high-ankle sprain, so it seems like it will be tough for him to play Saturday. Wide receiver Early Doucet, by the way, is the emergency quarterback. At this point, nothing is official. I don’t know what the extent of Hall’s injury is right now. But for those asking, I’d still expect Bartel and Skelton to back up Kolb this season, unless Croyle — or whomever the Cards might sign — is fantastic. The other two guys have been in the system, a new quarterback is playing heavy catch-up, and the only reason he would be here is because of injuries and not because they were looking to add a QB. Croyle could be an option because he played in Todd Haley’s system, which is similar to Whisenhunt’s, for obvious reasons. Croyle has played in 18 games over five NFL seasons, throwing eight touchdown passes and nine interceptions. He was 8-for-19 for 38 yards in two appearances for the Chiefs last season. A successful first step. That was the general theme coming from the Cards Thursday night after beating the Raiders. It’s hard to look at it any other way. I will say this, the game looked to me a lot like any other preseason game. In other words, it wasn’t overly sloppy, it didn’t reflect to the naked eye (or typical fan) the lost offseason or lack of practice time. We’ll see if that holds true once games start for real. Translated: That wasn’t what will happen in the regular season. — Running back Ryan Williams looked explosive at times in his first work, but he played behind both Beanie and LaRod Stephens-Howling. I thought the Hyphen flashed on a few of his runs too. — You could see the experience working for the second-unit offensive line, especially when they took on the Oakland backup defenders. — The first-unit pass rush didn’t create a ton of pressure. It’s early but that’s something to keep an eye on. The defense did make a lot of third-down stops when it had too, though, with batted balls and some hurries. — You can see why the coaches like cornerback A.J. Jefferson. I still don’t know if he holds off the competition to remain a starter, but it is hard not to see him ending up in the mix for playing time. — The first-unit offensive line improved on Kevin Kolb’s second drive, and on a couple of his incompletions/scrambles, he had time just no one open. — Rookie fullback Anthony Sherman, as both a blocker and special teamer, looks like he is going to be a good one. — The Raiders’ captains screwed up on the coin toss, which is the reason the Cards got to receive the kickoff to open both halves. The Raiders won the toss, but instead of electing to defer, they said kickoff. They wanted the ball to start the second half, but language counts and it let the Cards get the first kickoff and then choose to take the second kickoff. — Speaking of kickoffs, it was interesting to see so many kicked short as teams looked at their players on special teams. I think, with kickoffs moved up to the 35 this year, we will have more touchbacks than that. — The outcome is meaningless and usually Whisenhunt doesn’t go out of his way to ensure a win in preseason, but his mood definitely reflects a win. It was also hard not to notice last night, after Janikowski belted the 57-yard field goal to take the lead, that the Cards were going to give some end-of-the-roster wideouts playing time – Sean Jeffcoat, Daiveun Curry-Chapman and Aaron Nichols – yet before the drive started, the Cards instead decided to give Max Hall better weapons in Isaiah Williams, Chansi Stuckey and DeMarco Sampson. — On that point, however, the Cards did go with their end-of-the-depth chart rookies on the offensive line on that drive. — Tight end Todd Heap was the only injury, and he looks like he’ll be fine long-term. That may be the best news of all.